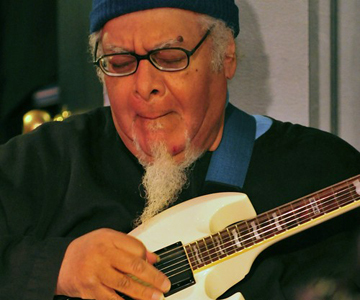 CHICAGO (AP) — Pete Cosey, an innovative guitarist who brought his distinctive distorted sound to recordings with Miles Davis, Howlin’ Wolf and Muddy Waters, has died, his daughter said. He was 68. Cosey died May 30 of complications from surgery at Vanguard Weiss Memorial Hospital in Chicago, said his daughter Mariama Cosey. Pete Cosey’s musical journey began early, his daughter said, noting that Cosey's father died when he was 9 years old. In the 1960s, Cosey was a member of the studio band at Chess Records in Chicago, where he played on Waters’ “Electric Mud” and Howlin’ Wolf’s “Howlin’ Wolf Album.” Cosey also worked with Etta James and Chuck Berry. He took a creative approach to stringing and tuning his guitars, and liberally applied the distortion pedal to his licks. He started to develop his unique sound as a teenager in Arizona, where he would play in the mountains near Phoenix, according to a Chicago Tribune article. His explorations of sound drew the attention of one of jazz’s legendary minds, Miles Davis. In an interview with music writer George Cole, published on Cole’s “The Last Miles” website, Cosey said Davis sought him out, wanted him at the front of the band and told him to turn up his guitar’s volume. In recent years, health problems had slowed Cosey, but he had been playing music in children’s hospitals and schools, according to the Chicago Tribune. Cosey’s daughter said that, to her father, music was a language.